Choosing Wisely® campaign and were made to more than 1,000 emergency physicians attending the Opening Session of the organization’s annual meeting in Seattle. 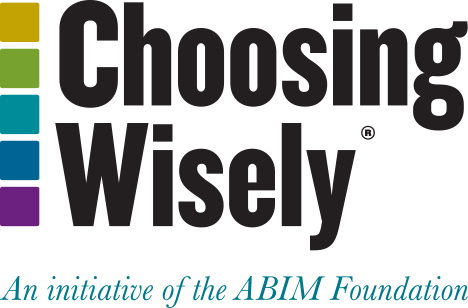 The mission of Choosing Wisely — a multi-year effort of the ABIM Foundation — is to promote conversations among physicians and patients about using appropriate tests and treatments and avoiding care when harm may outweigh benefits. Since launching in April of 2012, more than 80 national, regional and state medical specialty societies and consumer groups have become Choosing Wisely partners. ACEP officially joined the campaign in February. ACEP’s five recommendations were developed through a multi-step process that included research and input from an expert panel of emergency physicians and the ACEP Board of Directors. In 2012, ACEP appointed a Cost Effectiveness Task Force, chaired by Dr. David Ross, an emergency physician in Colorado and medical director for more than 50 EMS agencies in Colorado Springs. To develop the recommendations, the task force conducted a survey of all ACEP members. ACEP previously declined to participate in the campaign because of potential conflicts of this approach with the unique nature of emergency medicine as compared with office-based practices, and because of concerns that advocacy for medical liability reform is missing from the campaign. Avoid computed tomography (CT) scans of the head in emergency department patients with minor head injury who are at low risk based on validated decision rules. Minor head injury is a common reason for visiting an emergency department. The majority of minor head injuries do not lead to skull fractures or bleeding in the brain— which would need to be diagnosed by a CT scan. Avoid placing indwelling urinary catheters in the emergency department for either urine output monitoring in stable patients who can urinate on their own, or for patient or staff convenience. These catheters are used to assist when patients cannot urinate, to monitor how much they urinate, or for patient comfort. Don’t delay engaging available palliative and hospice care services in the emergency department for patients likely to benefit. This is medical care that provides comfort and relief for patients who have chronic or incurable diseases. Early referral from the emergency department to hospice or palliative care services can benefit patients, resulting in both improved quality and quantity of life. Avoid antibiotics and wound cultures in emergency department patients with uncomplicated skin and soft tissue abscesses after successful incision and drainage and with adequate medical follow-up. Skin and soft tissue infections are a frequent reason for visiting an emergency department. Some infections, called abscesses, become walled off under the skin. Opening and draining the abscess is the appropriate treatment; antibiotics offer no benefit. Avoid instituting intravenous IV fluids before doing a trail of oral rehydration therapy in uncomplicated emergency department cases of mild to moderate dehydration of children. Many children who come to the emergency department with dehydration require fluids. To avoid pain and potential complications, it’s preferable to give these fluids by mouth instead of the use of an IV.